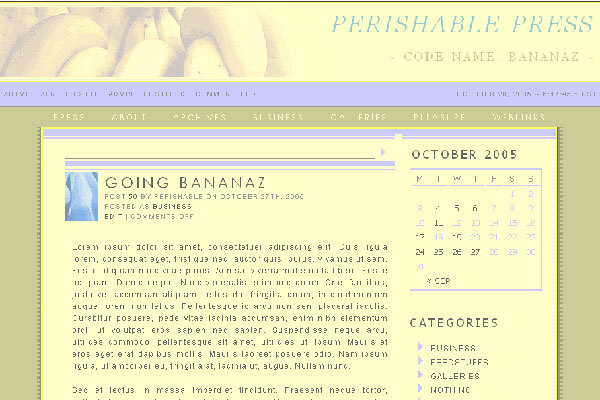 Perishable Press serves ’em some bananas with this release of the Bananaz theme for WordPress. Bananaz is highly customizable, with a unique two-column hybrid design that merges fixed-width content with a liquid header and footer. Also, the Bananaz theme combines semantic markup with the sheer miracle of CSS, so the design validates as XHTML strict and displays consistently across all browsers. Plus, Bananaz is configured to support several popular WordPress plugins (see installation notes for further details). Bananaz version 2.0 now available! Bananaz 2.0 features consolidated and enhanced CSS & XHTML because I just can’t get enough of that good-old, down-home markup-presentation dichotomy. The new version not only features cleaner code, it boasts several subtle graphical & design improvements as well. You simply must check it out. Hilarious, “The Bananaz theme is extremely gay!” Literally laughed out loud.